Preheat oven to 450 degrees and line a baking sheet with parchment paper. Dust a counter top lightly with flour. In a medium bowl, combine baking mix, bacon, and chopped thyme. In a separate bowl, whisk together the sweet potato, milk, and brown sugar. Pour wet mixture into dry mixture and stir until just combined. Dump mixture out onto a floured counter and knead a few times just to finish mixing the dough. Pat out into a circle about 1/2 inch thick. Cut biscuits and arrange them on a parchment-lined baking sheet. Bake at 450 degrees for 8 - 10 minutes until just lightly browned on top. 7. Enjoy warm with a little butter. Recipe notes: To make 1/2 cup of mashed sweet potatoes, I just peeled one smallish sweet potato, cut it into chunks, and boiled it for about 15 minutes until it was fork tender. I put the potato through a food mill, but you can mash it however you like. 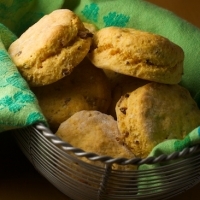 Just make sure that it’s tender enough not to leave little chunks in your biscuits! You could also mash a leftover baked sweet potato. Mmmmmmmm... Sweet potato AND bacon, a can't-go-wrong combo. Gotta try these! Thanks.